So, here we are on Throwback Thursday, where I get to post some of my old favorites from Older Eyes – Bud’s Blog. Older Eyes wasn’t always as confident and cosmopolitan as he is at 71. He once was a shy high school boy and an FSW. A what, you say? Read on – originally posted in February of 2014. When I was a Freshman in high school, my Mother signed me up for dance lessons. I really don’t remember how that came about. It was true that at school dances, I was a Fast-Song-Wallflower, sitting with the other FSWs until the DJ played a slow song. There were only two dance steps you needed to know to dance every song … Slow Dancing and the Bop. Slow Dancing was just walking in circles with a girl in your arms … even I could do that. The Bop mystified me. Then again, I am to this day a deliberate learner of dance steps. My wife, Muri, could walk onto a floor and be dancing a new line dance in a few minutes while I was still mumbling, What was that fourth move? So, it’s possible I told my Mom that I needed to learn to dance and she signed me up. Possible. My Inner Adolescent tells me that she was afraid her brainy son was going to be a social misfit and decided to enroll me on her own. Surprise, surprise there was a girl from my homeroom in my dance class. Because I considered her one of the popular girls, I was embarrassed. It never occurred to me to ask myself, Why is she here if she’s so popular? At any rate, there I was in ballroom dancing class with a dozen other socially challenged teenagers. Note: ballroom dancing, not high school gymnasium dancing. I learned the waltz and the foxtrot, which were just harder-to-follow versions of Slow Dancing. I learned the Rumba and the Samba and the Tango and the Cha-Cha. 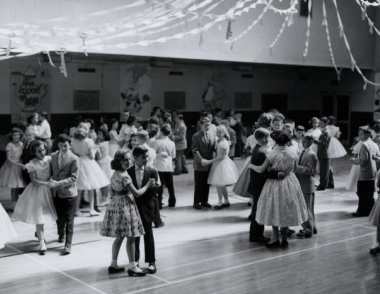 Latin American rhythms were not exactly a staple of the East Haven High School dances, but some couples on American Bandstand were beginning to dance the Cha-Cha to songs like Johnny Angel. One point for Mom. Then there was the Lindy, which our dance teacher assured us was the same as the Bop. Yup, and Glenn Miller was the same as the Danny and the Juniors. To this day, I don’t know how to Bop, not that it matters any more. In 1960, Chubby Checker introduced a dance called The Twist to the world. The Twist had no steps, unless you consider stepping forward and stepping back as dance steps. It would take until my Senior year of college for a pretty young woman to answer in the affirmative but it was worth the wait. And as a footnote, I got to use my dance lessons at my high school proms, where I was the Fred Astaire of the dance floor. Next to the picture of my Junior Prom date in my yearbook, she wrote in her graceful cursive, You dance divinely. Really. Not bad for a former Fast-Song-Wallflower. Not bad at all. This entry was posted on October 29, 2015 at 3:36 pm and is filed under feeling older. You can subscribe via RSS 2.0 feed to this post's comments.